So Shahid Malik connived at an undoubted tax or VAT fraud by agreeing to pay £300 a month of rent in cash and not to ask for a receipt. That a government minister should do such a thing and not resign is despicable. That a Prime Minister should not require his resignation is an abomination. But for Malik to claim that such tax fraud 'is a Muslim thing' is utterly beyond any excusing. How much more filth must we stomach from this Rotten Parliament and from this Rotten Government? The prospect of John Bercow, a politician even more oleaginous than Ben Brogan, as Speaker shows that many MPs have learned nothing from recent events. An immodest man of modest abilities, Bercow will do little to convince the public of a new mood of selflessness and altruism in the House; a Labour block vote largely calculated to spite the Tories rather than to provide the House with a Speaker of ability and probity will be seen by the public for the sleazy gesture it is. Labour's insult to the British people in imposing this narrow partisan Speaker on us will not be forgotten. For whatever reason at half five this morning I wrote Ben Brogan. Students of political lubricity will have realised of course that I meant Ben Bradshaw. My utter apologies to Ben Brogan, who is not in the least oleaginous. Gordon announced the membership of his National Democratic Renewal Politburo Sub-Committee yesterday; Jack Straw, Harriet Harman, Lord Mandelson, Alistair Darling, David Miliband, Alan Johnson, Hilary Benn, Douglas Alexander, John Denham, Shaun Woodward, Baroness Royall, Jim Murphy, Peter Hain, Michael Wills, Nick Brown and Steve Bassam. 2. To agree State funding for, er, the Labour Party. Now of course if the government were to establish a genuine advisory team on constitutional reform, it would no doubt include Michael Pinto-Duschinsky, the national political funding expert, Helena Kennedy, who chaired the Power Commission, the LSE's Tony Travers, Antony King, David Butler and Ivor Crewe all also from academe, Simon Jenkins, now running the National Trust but a Localism expert, plus UCL's Robert Hazell. The LGA would also contribute a member. Political members from both the Lords and Commons - and I'd personally like to see Eric Pickles included - chosen on the basis of their experience and wisdom, rather than sycophancy and tribal loyalty. Such an advisory team might well come up with a framework worth having a referendum on. Absent any of the above as standing members, Gordon's team has about as much credibility as a snake-oil salesman at a pharmaceutical convention. 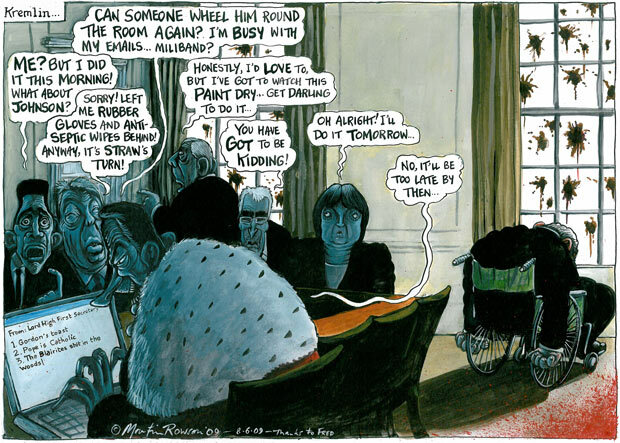 As far as Martin Rowson is concerned, Gordon remains one of the living dead. Incontinent, confined to a wheelchair as the cabinet squabble, with Mandelson running the country, he looks out of a Downing Street window smeared with ordure. Many politicians are said to be eager to acquire their political cartoons. I'll bet there's one that's not. No one mourns the passing of an over-deferential, rigidly stratified society. Social mobility - a good thing - depends on a degree of permeability, and 'taste' discriminants have no place in a meritocracy. However, the success of a meritocracy depends on rewards accruing to those with merit that don't accrue to those without. Not all such rewards are financial; status, or an emotional reward, may be as much of an incentive for those with merit as hard cash. Sometimes it was the minutae of a devolved State that most reinforced status, such as the counter-signing of a passport application. At one time, in my youth, countersigners were restricted to doctors, solicitors or barristers-at-law, justices of the peace, ministers of religion, MPs and a few others. Dentists and vets, pharmacists and even junior police officers were not considered quite honest enough to do the job. Nowadays the list includes virtually anyone who can tie a tie-knot and write in cursive script. It may now be much easier, but we've lost a sort of social 'glue' that means that 'being known to' persons of local social consequence is no longer important. And their status, which cost the taxpayer nothing for this minor, but essential, declaration, is lessened. At one time, being an MP held substantial social cachet. It conferred substantial status. A letter from an MP to the Town Clerk was a matter of great seriousness. And in their surgeries they got to see the articulate middle classes who wanted their passport applications countersigned and not just welfare recipients after a bigger council house. Not for some time now, of course. And the expenses scandal, together with an abandonment of honourable behaviour by Parliamentarians and especially ministers, has put beyond any hope of recall any degree of respect whatever for MPs as a class. I don't applaud this. I am desperately sad that our MPs have lost the respect of at least a generation, and perhaps more, of the British people. No amount of Parliamentary or constitutional reform will return it; Parliament's woes are by no means over, and the reputation and status of MPs has not yet fallen to its nadir. No-one now would consider an MP to be inherently more honest than a dentist, or a police constable. I suspect estate agents, journalists and even paedophiles will score better than MPs in the next 'most hated' poll. At a time when the dying parties need desperately to cleanse themselves of the foetid political class, of 'professional' politicians, of apparatchiks, chancers, chisellers and blow-ins, and fill their ranks with men and women of independent mein, of experience and proven integrity instead, this does not bode well. In a footnote to the euro results, and as pointed out already, Gordon Brown has managed to secure a lower even poll than did Michael Foot in 1983. Foot is therefore rehabilitated from the posthumous odium of having been Labour's worst-ever leader. Of course Foot only talked about nationalising the banks. Brown actually did it. The electorate has spoken. Labour's abysmal showing at the euro polls is the voters' damning verdict on Gordon Brown's Labour government. Brown now has not the slightest moral right to continue in government without an election. Gordon may just imagine that he's 'sticking with the people at their time of need' but the people want to make their own choice about who sticks with them. And it's not Gordon. Gordon may imagine that it's Labour's 'duty to ensure that people act fairly and responsibly' but the British people are quite aware of their own duties and need no lessons from Gordon. Gordon may imagine that 15.3% of votes is a 'test of our character, a test of the government and a test of our beliefs' but 15.3% means Labour have failed the test, and it's time to leave the exam room and think about a career in Macdonalds. Above all the arrogance of Brown's deluded self-deceit that he can govern the nation in spite of the wishes of the British public, against their clear message of 'GO! ', brings us into dangerous constitutional waters. Will it take three millions of voters tearing the gates from Downing Street before a helicopter carries him to exile and political death? I appeal to all Labour party members to act to prevent a crisis that will damage our nation forever. Gordon must go. Now. Labour councillors in the Metropolitans and London boroughs must be hoping that Brown will cause an election before May 2010; if the public mood is allowed to fester until then, it will be wipe-out time in Labour's local heartlands. An early general election may just save local Labour councillors in a year's time. Are you listening now, Gordon? "To those who feel the political system doesn’t listen and doesn’t care; to those who feel powerless and have lost faith; to those who feel Westminster is a distant place and politics simply a spectator sport: I will strive to earn your trust. To earn your trust not just in foreign policy but earn your trust in our schools, in our hospitals, in our public services, and to respond to your concerns. 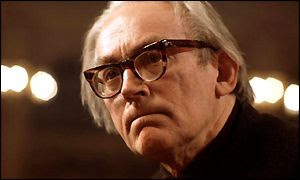 And by listening and learning, I want to become a voice for communities far beyond"
It was le Carré I think who wrote of a successful con-artist character in one of his novels that 'reality was whatever he believed it to be'. Whilst the capacity for convincing self-delusion may be an essential quality in a con-man, or a spy, it is perhaps less so for a Prime Minister. All politicians lie, of course, but few lie with the fatuity with which Gordon Brown does. It was a source of universal amusement when he categorically denied calling off the election at the end of 2007 because he was scared of losing. And on Friday, when he categorically denied he had wanted Balls in the Treasury, the clumsy lie was again universally recognised. Blair of course would have diverted both questions with humour and the smug self-deprecation he was so good at before the camera. That Gordon Brown doesn't have the intellectual equipment to do the same, that his thought-processes are clumsy and slow-witted, may be one explanation as to why he retreats so quickly to risible lies. But an alternative possibility is that Brown is so self-deluded that he actually mistakes the lies he tells for truth, and this is profoundly concerning. I'd rather have a stupid PM in Number Ten than a mad one.